The detail looks fabulous, especially the large overhead gazebo type area. It is fascinating how that transformed in just a short amount of time from just a marshy area of shrubs and trees to the bridge. Designed & built completely from scratch, the construction of the Scenic Point Park boardwalk utilized YBC’s deck level construction methods while incorporating the trademarked Decero™ Design philosophy. Without disturbing any of the environment, the bridge construction is peacefully woven into the wooded and marshy area, complementing the surrounding scenery flawlessly. In combined efforts to protect the environment, YBC employed Greenheart Hardwood timber piling – utilized for its positive effect on the environment. The boardwalk integrates the exclusive York Timber Protective Systems™ to ensure lasting aesthetics and longevity. 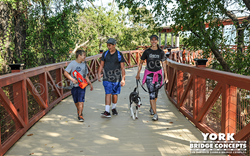 The boardwalk incorporates 10 feet of consecutive spans, reaches 20 feet at its highest point, and features unique elements such as the Wire Mesh Hand rail series and the Overlook Area with a Laminated Timber Roof Structure. 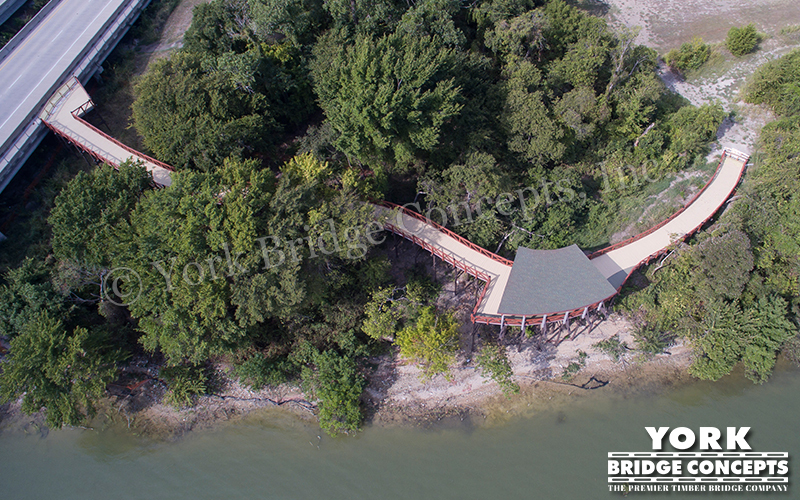 “We envisioned an overlook that focused on the wide open view of the lake and came up with an ‘amphitheater’ styled covered viewing area with laminated timbers pointed to the open water with access for bicycles to ride through,” states James M. York, President of York Bridge Concepts. Thomas Smith, local Rowlett resident has noted: “The detail looks fabulous, especially the large overhead gazebo type area. 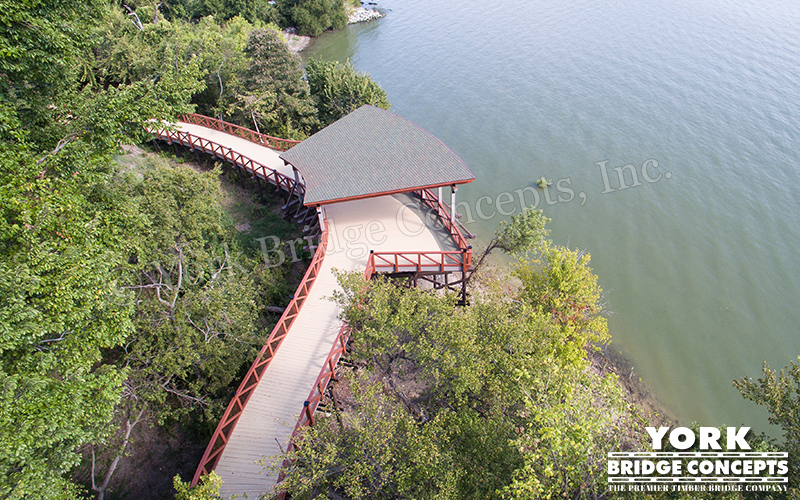 It is fascinating how that transformed in just a short amount of time from just a marshy area of shrubs and trees to the bridge.” With amazing detail and superb craftsmanship, this York Timber Boardwalk will surely be a major attraction for the citizens of Rowlett for generations to come. 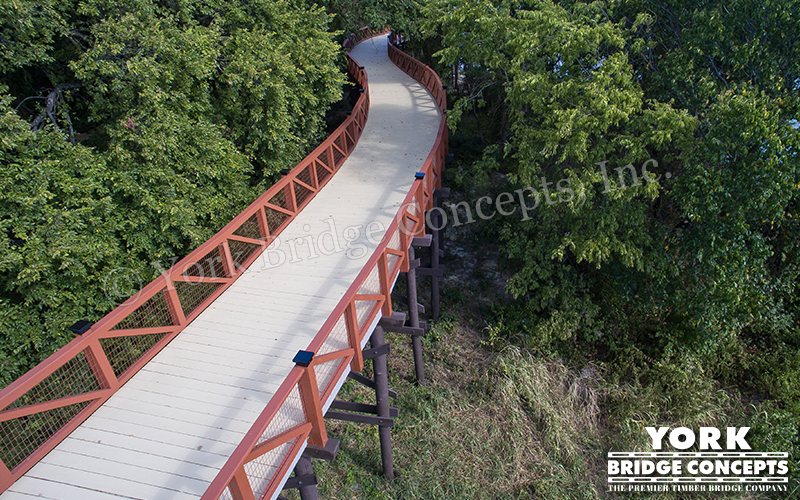 York Bridge Concepts, Inc. (YBC) is the nation's largest on-site timber vehicular bridge builder. YBC works with industry-leading owners and developers on prestigious projects throughout the U.S. and internationally, creating more than just a solution for crossing lakes, streams, creeks, wetlands or ravines. In this competitive real estate market, developers who want to ensure that their project stands apart from the competition use York Bridges to add value and create a feeling of exclusivity, warmth, and quality for their customers. Based in Lutz, Florida, with over 30 years of experience, YBC has become well-known for their expertise and cutting-edge innovation in the Longevity and Architectural beauty of timber bridge design. For more information, contact Gil York at (800) 226-4178 ext. 109 or visit http://www.ybc.com.